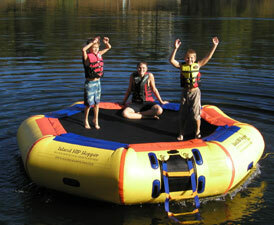 Parasail Workshop proudly offers you the highest quality, most affordable Water Trampolines. 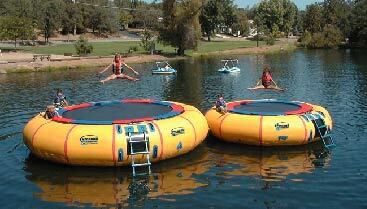 Made with the highest quality materials and uncompromising workmanship, our Water Trampolines offer exciting and relaxing fun for all. Either great exercise or calm laid back lounging, you decide and enjoy. Easy set up (about 30 minutes), and easily transported by personal watercraft or boat. Then just anchor and have fun. 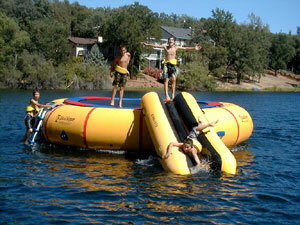 Great for lake homes, summer camps and commercial beach resorts. Workshop Tramp 12, Workshop Tramp 15, Workshop Tramp 20 and WorkShop Tramp 25. Heavy commercial construction using 28oz 1000 Denier PVC Material. 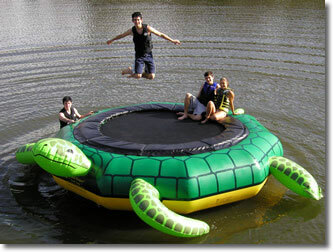 #2 121 lbs #1 70"x18"x11"
The ISLAND HOPPER "Turtle Jump" is the lastest addition to the Island Hopper water trampoline line. Designed with arms and legs that extend to a 20" overall width for greater stability, the new Turtle Jump will easily withstand summers of hard use. With color infused graphics and electronically welded seams, the inflation tube is precision engineered from 28 ounce 1000 Denier PVC material. The Turtle Jump comes as a complete set that includes an oversized storage-carry bag and repair kit. Additional power inflator or shop-vac needed for inflation. 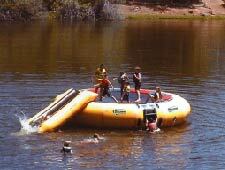 Island Runners-connectable, pontoon assisted climb/sit/walk on swim floats. 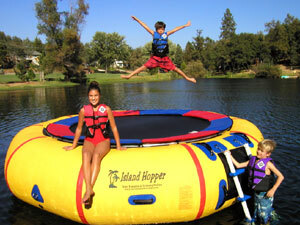 The Island Hopper"Turtle Hop " is the newest addition to our water bouncer line. 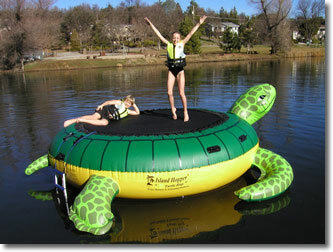 The TURTLE HOP sets up in minutes and is easy to transport. Constructed of sturdy 30 gauge PVC material with electronically welded seams, the graphically enhanced , independently chambered head, arms and feet provide a wider and more stable platform, and will add to the kids' swimming enjoyment. Sturdy 30 gauge PVC material. 4 anchor-tie D-rings for safe and secure mooring. 3 step "easy access" ladder.